MAGICAL MELODY: Mayan Calendar Shift into the FIFTH NIGHT in November! Mayan Calendar Shift into the FIFTH NIGHT in November! Note: We discontinued the Relationship Report in June 2008. Welcome to the Relation-Ship Report! 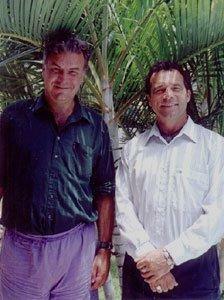 Image is of Carl and Ian in Cancun. Carl Calleman was born in Stockholm, Sweden at noon (May 15, 1950, Mayan Sign 5 Jaguar) and Ian Xel Lungold (January 26, 1949 - November 16, 2005) Mayan sign 12-Sun-Ahau, worked together for many years deciphering and interpreting the Mayan Calendar. Ian passed away 16th November 2005. The Key Phrase for this month: Return to the Garden and Feel Good! What a powerful time we are in right now as we come to the close of the Fifth Day cycle within the Mayan calendar and as we near the end of the Gregorian year. The Light within the past 2 months has for many been catalyzing significant awakenings and detoxification. Have you or someone close to you been experiencing physical or emotional health challenges? Are you finding it difficult to communicate with those close to you and are exploring new ground rules or ways of getting your message across so there is win/win for all concerned? Issues galore are coming to the head now and many of us will be assessing our lives with greater scrutiny, as we enter into a cycle when there will be no stones unturned as we prepare for the coming year. Next year we intuit to be a time when there is so much that will be coming apart to make way for the new world and community that is birthing. In this issue, we have an abundance of information and links for you as it relates to the Mayan cycle change, as we collectively shift into the Fifth Night. The two of us have been sitting in our usual listening sessions, as Source and our Family of Light tell us that this current period marks the point when WE are being guided to commit to new levels of health and wellness as a pathway through these tremendous spiritual shifts. Our evolutionary course has been in acceleration mode for some years now; however in 2007 we have reached an apex point, a time when we are receiving so much Light which has been coming in fast and steady. Therefore; in order to successfully move through this transformative time, our bodies and beings require us to upgrade our capacities to effectively process this Light. Our inner temple (house) is being rewired completely now. At this stage in our collective process, our bodies as our base station need to be able to effectively process, integrate and sustain this energy. Within this next year we foresee that there will be a revolution emerging as it involves health and wellbeing. Many throughout the world will finally be truly - REMEMBERING the Deeper MYSTERY - as it relates to FOOD and what is essential for real well being. We are collectively being called to return to the garden; however this often involves embracing the hells of our conditioning. This return path requires us to master our bodies as well as our minds and emotions so we can be more efficient with our own energy as well as addressing our relationships with our resources within our world. The Creator is quickening us in support of our being able to RESOURCE our selves in ways honouring of the sacred relationships within all life. Therefore, this shift will have us looking at what environments, foods and relationships contribute to our feeling well and good. We will finally be making the connections which have long eluded us as we put together the missing bits and pieces. We may also witness others around us making significant strides forward as our denial breaks and our commitment shakes the foundations of resistant ego being in control of our activities. We are entering more fully into the process of break down or as some refer to it as the great fall on our return path to unity. This process is facilitative of life restructuring at every level. We have some interesting information here for you to explore about the next Mayan cycle we are soon entering; referred to as the Fifth Night. Today the 9th of October is recorded within the Mayan Calendar as AHAU, (Mayan Glyph meaning Light/Lord, and Sun). This is the 20th day sign. It is on this day that a portal is opened to allow for increasing light. On this day you may like to intentionally open to receive this Light consciously, perhaps directing the Light to an area of your life where you would like to experience more positive support. Perhaps may even setting an intention for the Light to support someone close to you. You can visit Carl's site to download your very own digital Mayan Tzolkin Calculator to find out the day-signs of yourself and others! Also know what the energy is of the day in Mayan terms and then visit the Mayan Portal Site where you can read each of the signs or symbolic glyphs within the calendar which highlight the energy of each day or cycle. Learn more about the energies so you can utilize them more consciously within your life. Throughout 2007 we have been in the cycle where the energies of Quetzalcoatl of the Galactic Underworld of the Fifth Day began November 24, 2006. Quetzalcoatl is symbolized by the Lord of Light, and so during this cycle we have been supported to receive profound Light catalyzing significant breakthroughs in consciousness collectively. However as if often the case with incoming Light, darkness is catalyzed to come to the surface to be addressed and transformed. Soon we will be shifting into the Fifth Night (meaning: destruction and challenge) of the Galactic Underworld. This cycle begins on the 19th of November 2007, a time when we will move into the energies of Tezcatlipoca, Lord of Darkness. This cycle begins from 19th November, 2007 and closes on 8th November, 2008. The midpoint of this cycle is on 16th May, 2008. Ian Xel Lungold has been studying the Mayan calendar since 1996. Ian says, the calendar is a roadmap of Creation. Intentions that we can match to times and events. He goes on to say, In other words, we now have a method for discerning what Creation has intended, and continues to intend, day by day, epic by epic. Over the last 16.4 billion years, Creation has followed a particular repeating pattern of 13 different intentions. These intentions have brought about various physical effects and events in Creation, and have molded all human history. To read more. Also see Ian's website Mayan Majix You can find out what your day sign is by visiting the site. See the following website (blog link not available here) for an abundance of information that the blog owner has collected. I was gobsmacked when I saw this page as it highlights so much of the information presented of the work by Carl & Ian. A job well done! A wise statement from Ian: the Mayan calendar is a portal to intuition and during the upcoming cycle of 2008, he says to heed the Hopi, who advise: 1) Know where your food and water are coming from, and 2) Know all of your relations. Getting out of the cities will be wise, he says, as "shrapnel may be flying" and the usual sources of food and water wont be as available. Lungold says ITZA is the Mayan word for magic, the stuff of life itself. As we collectively experience profound spiritual shifts within our lives, so it also is impacting our patterns of weather. Expect the unexpected over this next month as the seasons play out in ways that are literally quite unpredictable. We can expect some terrific winds around the globe. Seismic activity within the earth is also increasing more consistently over the next few months. In New Zealand alone over the past two weeks there have been over 25 quakes, and in last few days some have been over 5.0 in magnitude. There is soon to be a New Moon in Libra on the 10/11 of October 10:01 PM PDT October 10; 1:01 AM EDT October 11; 5:01 AM GMT (This is a time to set new intentions for the next cycle through meditation, prayer and or a ritual). Then we have the Full Moon in Taurus/Scorpio, 25/26 October, 9:51 PM PDT October 25; 12:51 AM EDT October 26; 4:51 AM GMT A great time to nurture and enjoy our earthy and emotional nature in a celebratory fashion. Perhaps a dance out under the moon? On the 27th and 28th of October, Pluto will be exactly on the Galactic centre in relation to the Earth. This wont happen again for another 248 years and the energy presented within this conjunction presents to us a quantum point or significant gateway supportive of conscious evolution. Be careful what you focus on! For a special treat have a look at this beautiful overview of 2007 as it relates to the male and female, love and sexuality from Robert Tkoch. We love the images too! Taking breaks or even short naps is really important during times of major shifts such as these at this time. Throughout this week, schedule 15 minute breaks that allow you to rejuvenate and truly rest. Notice how doing this helps you to feel more present and energized to do the things you need or want to do with more joy and reserves of energy. What are you saying you need to do, but yet are putting off? Where are you not keeping your commitments? What are you doing that is really making a difference in your life that has you really pleased with yourself? Are you willing to celebrate your SELF by giving yourself something special today as a way of acknowledging where you are keeping your commitments? We would appreciate to hear from you, so please feel free to ask us any questions, give us your feedback and let us know what you would like us to write about or address in our upcoming newsletters. Max and I wish you love in your heart, joy in your sails, and lightness within your life! Receive empowering information, potent exercises, and facilitative processes so you can access your inner wisdom in support of getting specific and real with what you really desire! Is there someone special in your life that is soon to have a birthday or is preparing to celebrate a special day? Are you wondering what gift would best suit such an occasion? How about an empowering and meaningful spiritual gift this year? Inquire to know more about our gift certificates for private sessions. See our directory below for ideas. See our Spirit Centred Services Directory for more good stuff in support of your heart story. 16 Sep 2008 @ 10:25: THE END OF AMERICA! - GIVE ME LIBERTY NEXT STEP! 2 Nov 2006 @ 08:52: Mercury Goes Retrograde - Powerful Time!